You’ve heard it over and over: “A picture is worth a thousand words.” It may be a cliché, but it’s also so true! Pictures can help us express what words can’t – especially at a difficult time, like in the wake of a loved one’s death. One place where pictures are especially expressive and appreciated is the obituary Guest Book. Seeing a photo in the Guest Book can help us remember, make us smile or laugh. 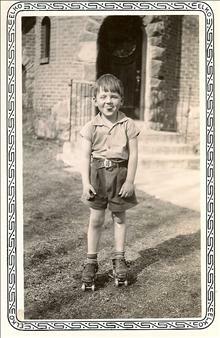 And a photo can show off aspects of the deceased’s personality that some people might not have known about – work friends can see what a great family man he was, grandchildren can see what Nana was like when she was young, and so on. A photo can also be a big help when you’re struggling to find the right words to write in an obituary Guest Book. When you attach a photo to your message, it automatically gives you something to talk about – the photo. You can write about your memories of the day it was taken, or the way it perfectly captures something unique about the deceased. When you’re really stuck, you can even choose to let the photo speak for you and submit it to the Guest Book on its own, without a note. Now that you know why to add a photo to a Guest Book, here’s how. It’s very easy, and there’s no charge. 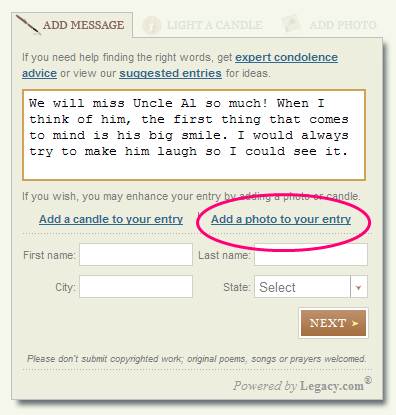 You can attach a photo to a condolence message you’ve written, or you can submit just a photo. First, you’ll need to have the photo saved on your computer, so it either has to be a digital photo or you’ll need to scan it if it’s an older, printed photograph. If you don’t have a scanner, try a copy shop or library, or the photo department at a drug store – they often have scanners for public use. Once the photo is saved on your computer, go to the Guest Book and see the section at the right side of the page where you can add your entry. 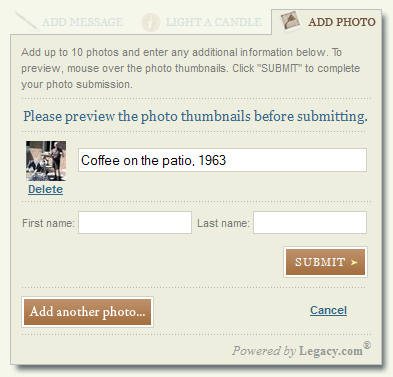 If you’re including a message, type it into the box, then click the “Add a photo to your entry” link. You’ll get a pop-up that lets you locate the photo on your computer’s hard drive (so make sure you remember where you saved it!). 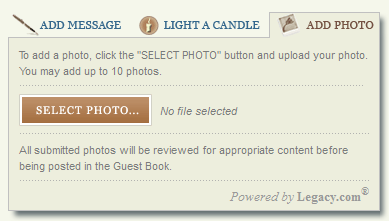 Once you’ve selected a photo from your computer, you’ll see a thumbnail version of the photo on the Guest Book page. You can then preview the photo by hovering over it with your mouse pointer, and you can add a caption if you wish. Once your entry, photo and caption look just right to you, click “Submit.” That’s it! Our staff will review your entry and/or photo – most entries are posted online within a few hours. So, what photo should you share? The sky’s the limit! 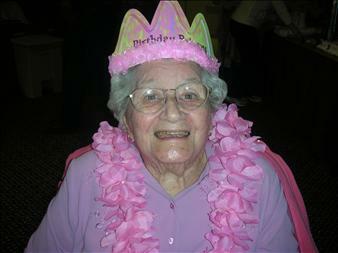 We see all kinds of great photos in obituary Guest Books. To get you started, here are a few of the most popular types of photos submitted to Guest Books. 1. Your loved one’s beautiful smile. We love to look at pictures of the people we miss, so lots of Guest Book signers submit portraits of the deceased to the Guest Book. Sometimes these are professional portraits, but they don’t have to be – a great candid or casual shot can be just as good or even better. 2. A favorite activity. 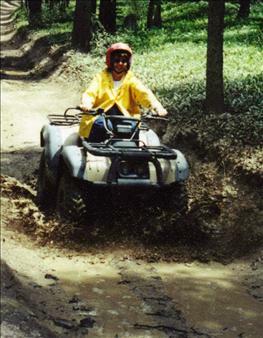 We like to remember our loved ones at their happiest, doing the things they most loved to do. So why not add a photo that captures that happiness? Whether they loved to go fishing, bake pies, race go-karts or rock babies to sleep, there’s probably a photo showing them doing that favorite activity with a big smile. Photo submitted to Janis Oxford’s Guest Book, published by the Palm Beach Post. 3. Good times with family and friends. You remember the fun times you had together – help other Guest Book visitors remember them too. Include a great shot of you and your loved one, or of a big gathering with family and friends. Photo submitted to Abraham Castaneda’s Guest Book, published by the Orange County Register. 4. A bit of history. A really great Guest Book photo album has a variety of photos that span all the years of your loved one’s life – including the cool vintage photos from an older relative’s childhood. Young family members might never have seen these classic shots, and older ones will love seeing a blast from their past. Photo submitted to James Wachter’s Guest Book, published by the Seattle Times. 5. Something funny. Even when we are grieving the loss of a loved one, it can still feel good to smile through the tears. A funny photo of the deceased is a wonderful addition to the Guest Book because it helps capture their personality and reminds family and friends of the laughs they shared. 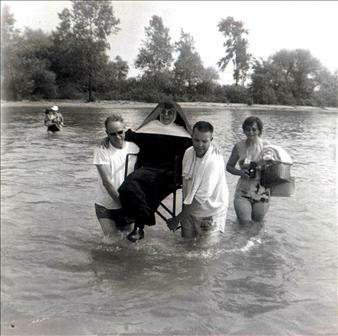 Photo submitted to Sr. M. Fidelis Ruwart’s Guest Book, published by the Connecticut Post. 6. Anything else that helps you remember and honor your loved one. Don’t just take our advice – submit any kind of photo you like! The Guest Book is a personal remembrance, and the photo album should reflect just what your loved one was like. And you don’t have to choose just one photo, either. You can submit as many as you like. Other obituary Guest Book visitors will be delighted to see a big photo album full of images of the person they miss so much. 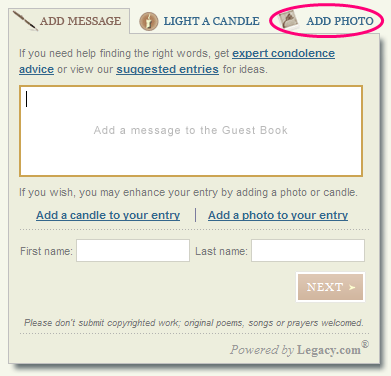 This entry was posted in How to write a condolence letter, Legacy.com Guides and tagged Condolences, Guest Book entries, Life at Legacy.com, Obituary Guest Books, Photos. Bookmark the permalink.